The flute group was formed by Hilary Gould and professional musician and a local flute teacher, Jane Groves LWCMD. Hilary, and several of Jane’s other adult pupils, wanted the opportunity to meet and practice with other like-minded flute players, to offset the “isolation” often experienced by the lone flautist. The first meeting was held in the music room of Jane’s house on January 11th 1997. Article and photograph from August 1997 published in March 1998 edition of PAN magazine (British Flute Society Publication). music room, with approx. twelve to fourteen members attending. 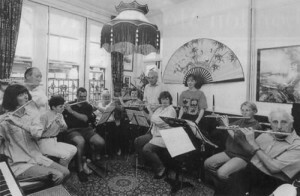 The group became known as the Cardiff Flute Group. The group moved to a new venue at St. Ederyn’s Church, Cardiff Gate and gave their first concert on February 22nd 1998. As nerves took over we inevitably suffered a few mishaps but our listeners were very sympathetic and appreciative of our first effort in public!! 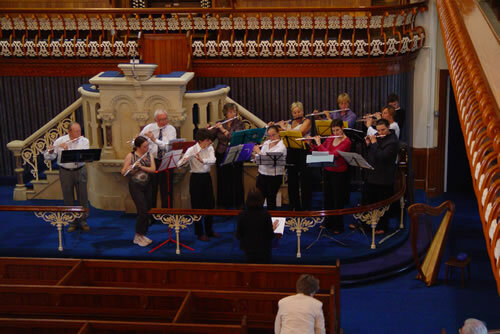 The Arts Council of Wales provided a grant towards the purchase of a group-owned bass flute. CAFE lost the services of Musical Director/conductor Jane Groves. It was a considerable time before a new M.D. was found and the group owes a great deal to those who helped to keep us afloat through that difficult time. Fortunately, Elinor Buglas, joined us in 2007 and officially became our Musical Director at the March A.G.M. of that year. Departure of our Conductor and Musical Director, Elinor Buglas. She was replaced by one of our long standing experienced members, Kristina Morgan, who took over as Music Director in January 2011.